Gary Coleman, best known for his role as Arnold in the 1970s-80s sitcom Diff'rent Strokes, died today of injuries he suffered in a fall at his Utah home. Coleman, who also appeared in 2003's Postal 2, was 42. TMZ reported Coleman's death just past 12:30 p.m. U.S. Mountain time. He had been in a Provo, Utah hospital since Wednesday, admitted in critical condition with unspecified injuries. TMZ reported Coleman died of a brain hemorrhage associated with falling and hitting his head. Coleman (pictured above at Video Games Live in 2005) shot to stardom on Diff'rent Strokes as a child actor, popularizing it with his outsize personality and many catch phrases. He found success after the show much more difficult to sustain. Coleman later accepted many roles, promotional appearances and cameos that traded on the ironic appeal of both the show and his character, Arnold Jackson, as well as the failings of the series' three principal child stars. In addition to his Postal 2 cameo and promotional work, Coleman was also the voice of Kenny Falmouth in The Curse of Monkey Island. This is a video of Coleman in better days, at the height of Diff'rent Strokes' popularity its fifth season, when the show looked at the new video game craze and tackled the subject of video game addiction. 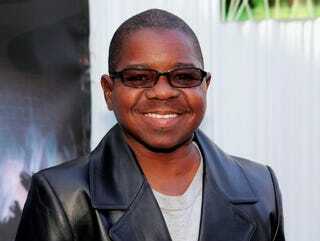 Gary Coleman, Feb. 8 1968 - May 28, 2010.